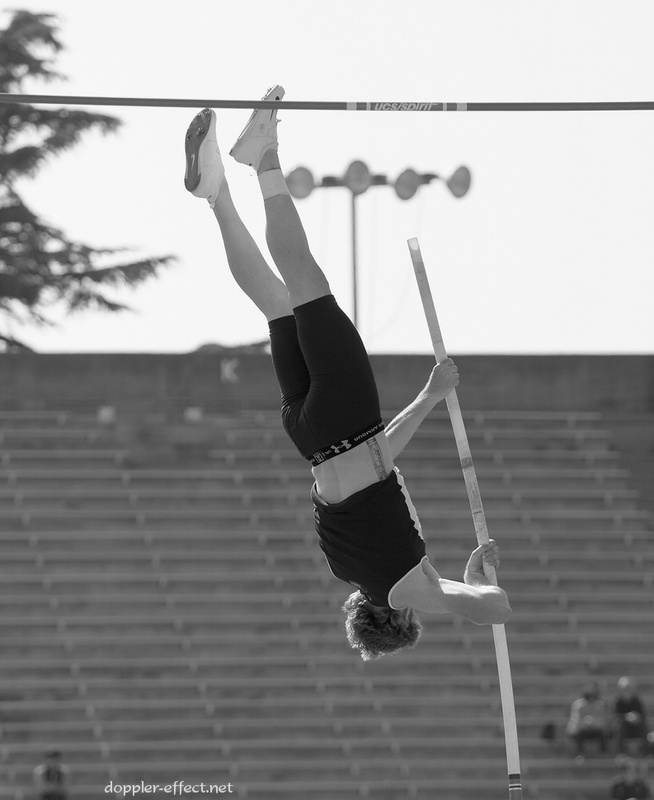 Last Friday, I competed in the vault at the Brutus Hamilton Invitational, held at UC Berkeley this past Friday and Saturday. After finishing, I started shooting the remaining vaulters, as well as some of the running events that were just getting underway. Berkeley's Jasmine Joseph leads the second section of the women's University/Open division 200m dash as the runners near the 100m mark. 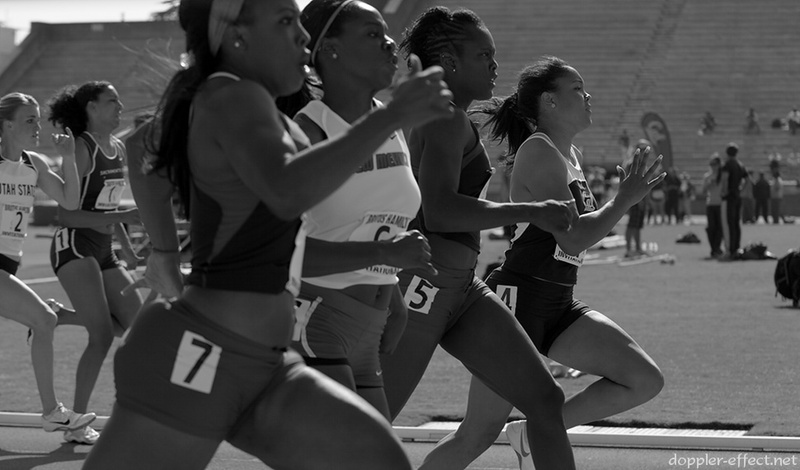 Joseph would fall back to third place by the finish line, completing in 24.71 seconds behind Shirley Pitts of University of New Mexico (lane 6) and Dahlys Marshall of University of Arizona (lane 7). Daniel Turvey's tattoo mirrors his vaulting pole as he extends upward during a vault in Friday's B section of the pole vault. Competing for UC Davis, Turvey would miss this, his final attempt at 5.01m (16' 5 1/4"), to finish in second place in the section with a best jump of 4.91m (16' 1 1/4"). 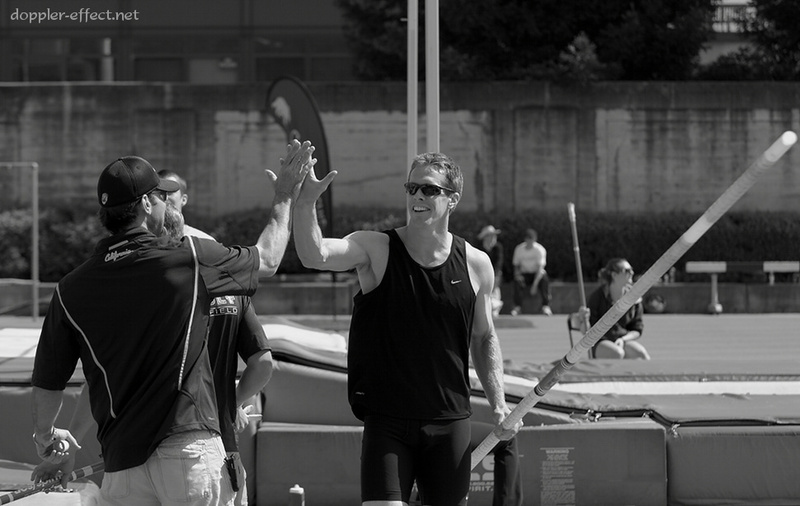 UC Berkeley assistant coach Mark Jellison (right) shares a high-five with Berkeley vault coach Scott Slover (left) after Jellison cleared a new personal record of 4.91m (16' 1 1/4") on his first attempt. With all first-attempt clears through that height, Jellison placed first in Friday's B section of the pole vault. Georganne Moline of University of Arizona collapses on the grass and begins to untie her spikes after competing in the first section of the women's 400m hurdles. Moline finished in a time of 60.53 seconds, good for second in her section and second in the competition. all of the shoes shown were nike! A lot of vaulters like Nike jump spikes, so no surprise there. It looks like Berkeley uses Nike apparel (you can see the logo on their shirts, for instance). As for the hurdler and the Utah woman in the 200, dunno. Personally, I like my Reeboks, but there's no doubting that Nike makes some nice track equipment.